Just like death and taxes, the comparisons between Stephen Daldry’s latest Trash and similar films like Slumdog Millionaire and City of God are inevitable and unavoidable. It has in common the impoverished young main character (in this case, characters) from Danny Boyle’s Oscar-winner, while also sharing the Brazil environment from Fernando Meirelles’ acclaimed 2003 film. With the common film buff, those comparisons can easily get in the way of enjoying this film for what it is by itself, and for the most part that is also true with this particular reviewer. It’s not that it’s a bad film, it’s not even worthy of dislike; by all accounts, it’s a passionate and well-made film partly thanks to Daldry’s tight focus and writer Richard Curtis’ reliable writing. However, when one thinks back on the style and overall story it tries to tell, it’s almost impossible to not picture any of those other films in your head while you do it. The visual style, for instance, doesn’t copy the work of Boyle or cinematographer Anthony Dod Mantle exactly, but the colour scheme is similar, the fast-paced editing and direction is familiar, and so on. Incidentally, this film’s cinematographer – August: Osage County’s Adriano Goldman – conjures up some niftily gritty shots here, whether it’s a landscape shot or a close-up on the devastated face of a person. However, the familiarity of it all clouds much of what can help this film stand out on its own – which is a shame, because there are some decent things to be found in this film. The acting, for one, is very strong – whilst Rooney Mara and Martin Sheen get top billing for obvious reasons, they are but mere supporting players; the true leads are in fact young boys Rickson Teves, Eduardo Luis and Gabriel Weinstein, none of whom have any prior acting experience. Daldry once again works his charm with debuting young actors that worked wonders for Jamie Bell all those years ago in Billy Elliott, and gets some strong and motivated performances out of all of them. As the designated “leader” of the trio, Teves’ Raphael is whip-smart, plucky and playful, but never to a point where it’s sugary and unbearable. Luis’ Gardo, meanwhile, has some strong emotional scenes alongside his more experienced adult co-performers; and Weinstein’s Rato – aka the “cute” one – is given a fair bit to do albeit not as much as the other two. All three have the right amount of natural on-screen charisma and chemistry to pass as fine and likable protagonists, and to keep you concerned for them when they end up in perilous and highly intense situations. Meanwhile, Selton Mello does an uncomfortably good job at playing the loathsome and corrupt detective pursuing the three boys; though are we the only ones a tad distracted by the fact that he looks like Adam Scott if he grew up in Rio de Janeiro? Somewhat surprisingly, for a film that aims hard to be that uplifting crowd-pleaser it wants to be, there are some shockingly harsh scenes of poverty and brutality throughout the film – perhaps on a slightly harsher scale than something like Slumdog Millionaire. One particular scene sees Raphael violently taken by Mello’s detective and some policeman lackeys, and put into a torturous situation likened by the character to a rollercoaster. It’s unnerving stuff, and what’s more his subsequent disappearance has other characters quickly accept the fact that he’s pretty much a goner. It’s a harsh depiction of this brutal environment, ruled over with a true iron fist by a corrupt politician (Stepan Nercessian) while thousands of people suffer in extreme poverty. If there was any film that could instantly put off tourism to the Brazillian capital, this would make a very strong case for avoiding most of its areas – and in the lead-up to next year’s Olympic games in the city, that could potentially be something of a setback. The main focus of the film is on these three young boys and their adventures in avoiding the authorities, which means that there are some areas that remain underdeveloped or introduced only to never appear in the story again. When seeking out a locker containing another clue in the wallet they initially find, Rato comes across one of his former employers who seems as intense and threatening as anything else in the movie; it feels like build-up to another encounter later in the film, but he never shows up again after that scene, not even in a passing reference. Maybe the idea is to show that there is always intimidation and threat on these streets even when the supposedly main threat is taken down, but if you’re going to waste precious time on building a certain character up then you might as well go all the way instead of abandoning it just as it gets going. Like we said, none of these comparisons or underdevelopments necessarily ruin the film, but it does undermine Trash’s desire to be its own thing regardless of what’s come before it. And in a film that does have some genuinely good things in it, that’s a real shame. 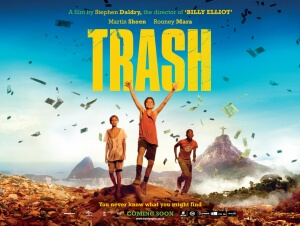 Trash is a well-made film thanks to Stephen Daldry’s direction and its spirited three young leads, but the endless comparisons to other films like Slumdog Millionaire and City of God, as well as certain underdevelopments, prevent it from fully reaching its own standalone potential.